We flew out on Thursday night and didn't arrive at our hostel until just after midnight. I had feared that my travelling companions would want to head straight out but I was pleased that the consensus was to head straight to bed. I'm an old man I know! We'd booked a Third Reich: Hitler and WWII walking tour for the Friday morning as a way to orientate ourselves round the city and take in a bit of culture. We met our friendly and incredibly tall guide Barnaby at Zoo station before setting off on the tour. I enjoyed the tour, but I wasn't amazed by it. It was a good way to see several parts of the city that I don't think we would necessarily visited on our own (the Tiergarden, Opera House or the unmarked Hitler's bunker). Barnaby gave a insightful and thought provoking description of the Holocaust memorial and was a good source of information on what to do during the remainder of our weekend. However, I didn't leave the tour feeling I new significantly more about the Third Reich than I did before. This could have been my fault for not really wanting to open my ears to the horrors of WWII on a jolly weekend away with friends. After the tour we were all chilled to the bone and in need of some lunch. We headed north on the U-Bahn to Schonhauser Allee as it was an area that was supposed to have a Christmas market. As is always the case when you are actually looking for an open cafe everything you walk passed seems to be closed. After a bit of searching we found a delightful little cafe serving hot chocolates, quiche and cake it hit the spot rather well giving us all time to warm up and recharge. It was also the start of a lucky trend where we found a few small and cheap cafes serving up a friendly welcome. After lunch we went to look for a Christmas Market that Barnaby had marked on the map for us. Unfortunately it wasn't open yet, which was the same with all of the Christmas Markets we could see being set up all over Berlin. They were due to open on the Monday after we left. Still feeling the cold I voted for an indoor activity in the afternoon so we headed to the Checkpoint Charlie museum. What a jumble of information! In good museums you don't really notice how well all of the infomation is laid out and enables you to build up the story of what you are being told. 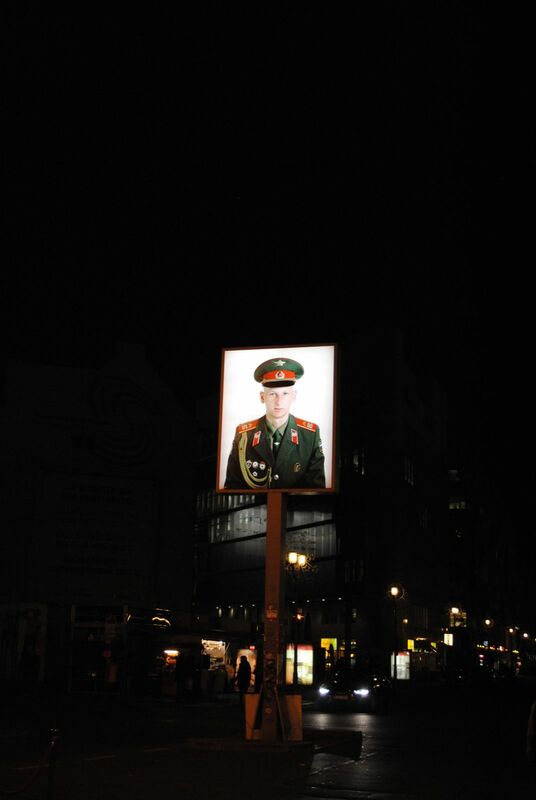 The people from the Checkpoint Charlie Museum must have missed that lesson at school. Every wall was absolutely packed with information boards and I found it so overwhelming that I stopped taking anything in. They need a good de-clutter. For example I've got no idea on what the space race or Mikhail Khodorkovksy have to do with the Berlin Wall or Checkpoint Charlie. The museum was at least nice and warm! Next stop was our first taste of German beer! Vix had been told of a great burger joint so we set forth to find it. 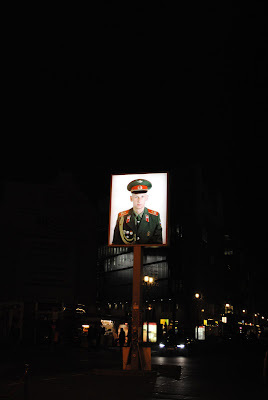 About a forty minute walk from Checkpoint Charlie we decided that we'd stop for a beer along the way. Just like the ubiquitous supply of small cafes, Berlin seems to do a good line in small bars as well. A local Berlin beer near Moritz Platz provided a refreshing midway rest. Onwards to our burger! Except that we couldn't find it. After several loops around what we thought was the right address we eventually stopped Burger Meister in a converted public convenience under the railway tracks. With limited seating it didn't look like the right place for dinner so we resolved to come back the next day and find somewhere a little warmer for dinner. We wanted some German food, but appeared to be in a Turkish / Vietnamese area so plumped for a bowl of noodles instead. After dinner we took the train back to near our hostel and stopped for a final drink of the evening in one of the nearby bars before hitting bed.